Students from the Anthropology department are at the forefront of addressing critical social and political issues of our time. 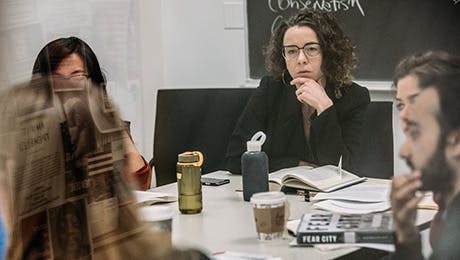 With a grounding in cutting-edge empirical, historical, and ethnographic scholarship, our Anthropology students are accepted to prestigious PhD programs, or find employment working in their area of study. Our MA students have continued their studies at top universities, including Princeton, the University of Chicago, the University of Pennsylvania, Cornell University, and New York University. They have also found employment as writers, analysts, and program managers and in other positions at companies like AllState and Smashing Ideas and organizations like Accion U.S. Project Network, SAVVY Contemporary Berlin, and MDRC. They have also found employment with companies and governments around the globe.